If there is any module whose dependency factor is applicable to all others functionality than it is “Admission Management” module. Admission Management Module handles the entire Admission Process of Students. It helps the organization to manage Admission inquiry, Admission form (online and in-premises), Admission set up, Mark entry, Student sorting based on merit, Admission confirmation, and related reports etc. So below are 4 key features must be there in admission management module. In Admission module enquiry form and admission form should be different to provide segmentation in process, for instance, many students comes for enquiry of admission, and operator enter information of the student in the software, but not all the students apply for admission, so in order to segment them in category this facility must be in module. Furthermore, same way Online inquiry and online admission facility should also be there. Moreover students data in admission inquiry forms can use to take follow up regarding the admission form school side. Well, this facility is basically define for schools, which set up their own criteria for admission such as written exam, aptitude test, or any kind of interview, it could be anything. Along with setup in admission module mark entry is taken in the software and merit list can also be generated according to the marks entry to sort out the students who are eligible to take admission for a course. Admission alert is a part where educational institute can send the SMS alert or notification to the students regarding their admission process or about the confirmation or rejection of the admission. This could be setup in both manual and automatic way. Reports are specifically defined by providing information aspects in one form, having reports of how many students applied for admission or reports on the inquiry made for admission can be define with the help of this functionality institute can get the cluster of information easily. 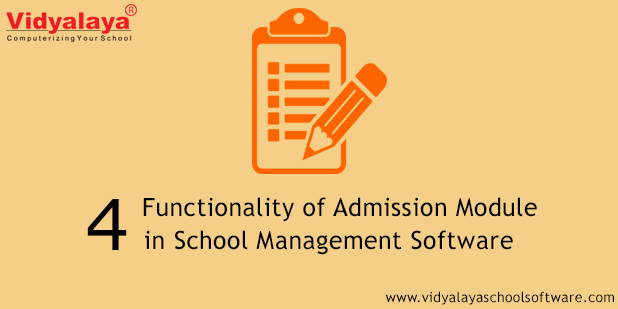 Hence above are the 4 functionality of the Admission Management module, although there are more functions that could help institute to conserve admission data more easily but above are the must. So if your school software doesn’t provide that, it’s time to think about it.